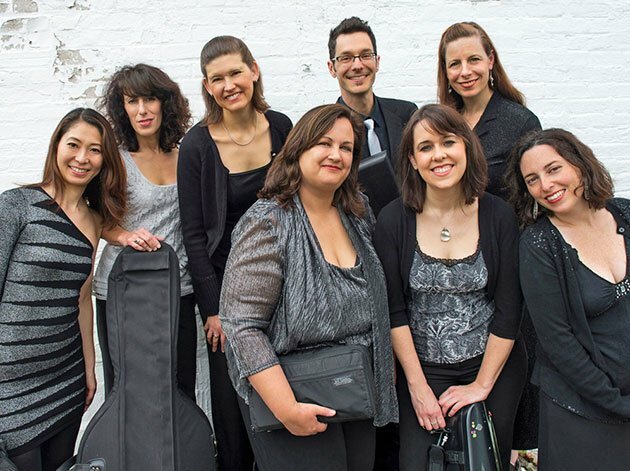 Radius Ensemble takes pride in citing “Eclectic Programming by the Numbers,” reporting about the 257 works offered since 1999: 24% were written before 1900, 25% in the last 25 years (including 24 commissions), and 25% by women or people of color. [Ed. Note: that leaves 26% unaccounted for.] The ensemble’s concert at Longy on Saturday night pretty much hewed to that pattern except for the missing category of women as composers. We did witness the minting of a new composer category, Nepalese. In 1954, Franz Hasenöhrl sliced, diced, and pfeffered Strauss’s 17- 18- minute tone poem for large orchestra into an eight- or nine- minute quintet. The thus-shrunken Till Eulenspiegel, Einmal Anders! (With a Difference) preserved all of the original’s charms. If the disruptive character’s life is but a joke, it is one of gossamer with even the death scene transfigured into a sly wink. Eran Egozy, clarinet; Adrian Morejon, bassoon; Anne Howarth, horn; Gabriela Diaz, violin; and Randall Zigler, bass all put across the subsets of personality, misadventure and disruption the witty Hasenöhrl so worthily assigned to them. In a programmatic symmetry, the allusion to Brahms’s Academic Festival Overture foreshadowed the closer. Perfection of ensemble and joy of musicmaking left players and crowd with broad smiles. Radius’s annual Pappalardo Composition Commission world premiere came from the 53-year-old Nepalese jazz composer-practitioner and film scorer Sharad Gurung, who recently arrived at Longy to hone his skills as an author of modern Western music. His Twelve in a Row for flute, clarinet, violin, cello, and piano could easily have fooled us into thinking we were hearing Schoenberg. If not exactly lyrical, it did fit nicely in the evening theme of “Impulses,” in this case an impulse to create something of emotional weight and idiomatic command for all its instruments. We warmed to its piquant smoothness and absence of aggressive angularities. The players inflected genially and seemed pleasantly smitten with the composer and his debut in this genre. Afterwards, remembering how Gunther Schuller had used but a single row for his long life as a composer, I asked Gurung how he had chosen a particularly winning such a one and if he could sing it. He could not, but he did assure me that he had followed all of the Schoenberg’s rules including always completing the row before re-starting it. He had already known something of counterpoint from his time in Nepal, but to Western ears, Nepalese counterpoint has “wrong chords.” He was pleased to hear this writer say that he had imbibed not a drop of the East from the piece. After Elliott Carter found Joel Hoffman’s (b.1953) solo oboe piece “unintelligible,” the composer noted, he clarified it with commentary from a second oboe part, thus giving birth in 1984 to the brief Music for Two Oboes. In the virtuosic execution of Jennifer Montbach and Mary Cicconetti, the etude’s multiple miniature short-fast episodes enthralled mainly as a catalog of effects and possibilities of the instrument, which, though it cannot play with astonishing speed or over a very wide dynamic range, has an absolute inability to play out of tune. The same cannot be said of strings, especially when they are required to play unisons and octaves in small ensembles. Brahms made such demands frequently in his Piano Quartet No. 3 in C Minor. Gabriela Diaz, in her sunny explication, imagined the opening piano attack as a gunshot. Yet, she remarked, Brahms’s turbulent emotions included not only unrequited love but also self-parody, inasmuch as he asked the publisher to include a color lithograph on the frontispiece depicting him in a blue suit and yellow vest with a revolver pointed at his head. The problematic performance that followed seemed to suffer from unequal weighting and stylistic discord among the players. Pianist Sarah Bob alternated appropriately angry double octaves with delicate raindrop commentary, seemingly pleased to lead and goad. Diaz’s juicy and highly inflected tone met our expectations of romantic expressiveness and matched well with Bob. But the viola of Noriko Futagami and the cello of Miriam Bolkovsky felt dry in comparison. Yes, with little vibrato and good balance, the choral-like string trio moments achieved near transcendence, but elsewhere, the ill-judged portamenti and poorly matched tones and tuning induced queasiness instead of longing for Clara. A merely congenial read, it elicited no demand for an encore. A quick note about the programming statistics: these categories are not mutually exclusive, so should not add up to 100. For example, of the 25% of works written since 1993, about half are by women. And we’ve done plenty of women pre-1993 too: Seeger, Beach, Schumann, Gubaidulina… Happy to share the full rundown if anyone is interested!